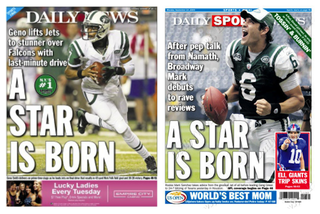 This is either a serious failure of back-page wood creativity, or a really bad omen for Geno Smith. Smith put up his first three-TD game, and led his first successful two-minute drill, and (most importantly) the Giants are terrible, so the New York tabloids are going to be green for the foreseeable future. That's exciting for Jets fans, and possibly a little intimidating for a QB who was supposed to be able to develop in peace. But that was always a silly notion, and New York's defense is good enough that there's a better-than-even chance the season ends in heartbreak and Smith takes the blame. Oh, nearly forgot: Mark Sanchez had season- and Jets'-career-ending shoulder surgery today. Good luck, Geno!